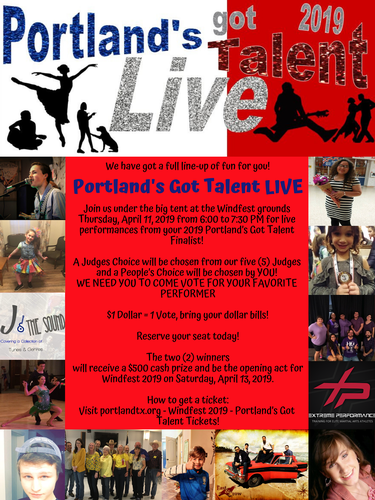 PORTLAND'S GOT TALENT FINALIST ROUND! Join us under the big tent for some great entertainment as you watch PGT 2019 Finalist perform! Doors open at 6:00 PM and the show begins at 6:30 PM. We will be selecting two winners to perform Saturday April 13! Help us choose your People's Choice winner! 1 Vote= $1 Dollar! We cant wait for you to see all of the amazing entertainment who entered this year!